Kiobashin - Stupid kioslaves for the masses. Stupid kioslaves for the masses. You are probably a KDE linux user, if you are reading this. And probably you already know that a kioslave is something handles a virtual file system under KDE. Well. I like KDE very much and I wanted to write something using KDevelop. After one or two minutes I realized that KDE programming is really easy and I decided to write something as stupid as cool. Here you are kiobashin, which is a Kio-slave that allow you to write your personal kioslave... using plain bashscripts. What is surprising is that it was written in about 4 hours. And I'm not a C++ programmer. What kind of license? Nothing. Take it and do what you want. Untar and do the classical ./configure && make && make install as root. That's all. Create a directory called kiobashin in your home directory and copy the bashscripts you found under the kiobashin-scripts folders. End of the installation. Open konqueror and go to kiobashin:/. There are all the avaible scripts shown as folders. Simply click on one of these and happy browsing! Let's try the "kwedshin.sh" script. Click the script's folder. Hey! 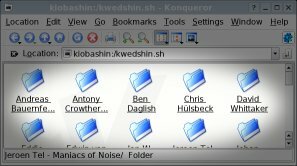 Seems like the "kwedshin.sh" folder contains some MP3s organized by author! ;) Saying the truth these MP3s aren't downloaded. The homepage was a bit grepped and reformatted by a script and the content was sent to kiobashin. However looks like a well organized folder! Really simple. 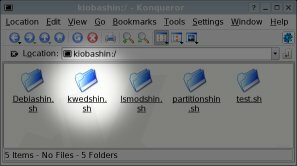 The kiobashin root shows all your *.sh scripts in your "kiobashin" directory in your home. When you "go into" a kiobashin script, it runs the script and parses the output. How? Will be called when you are at kiobashin://yourscript.sh/. yourscript.sh *dir "folder 1" "subfolder 3"
Will be called when you are at kiobashin://yourscript.sh/folder 1/subfolder 3. 1. If you want a folder simply echo a "*" with the folder name. ...that means an MP3 that is 300K big. kes@kesiev:~/kiobashin$ bash kwedshin.sh *dir "Edwin van Santen"
yourscript.sh *mime "my Mp3s" "misc" "foo.mp3"
kes@kesiev:~/kiobashin$ bash yourscript.sh *mime "my Mp3s" "misc" "foo.mp3"
yourscript.sh *file "virtual docs" "more stuff" "readme.txt"
Running it from the command line, it will show the pure file. kes@kesiev:~/kiobashin$ bash yourscript.sh *file "virtual docs" "more stuff" "readme.txt"
that isn't a real file on the hard disk! Clear? Look the test.sh kiobashin script for a clearer example. Any particular reason. I just wanna know how hard should be write a virtual filesystem for KDE and now I'm impressed about how easy is. I've just expanded the example provided by KDevelop. And not too much! KDE is a really cool and easy enviroment and has a really well-organized structure. I think that lacks a more n00b-friendly code editor (cough cough... code autocompletion...) and an updated tutorial. Some suggestions? A good tutorial for KDE application development? Two friendly words? Write @ kesiev@hotmail.com. I'll surely answer to you!